This request is to be able to get the XY value of the mouse over the outputImage while using protocol compositions (filter & generator). Currently we are only able to get the mouse.xy when using a windowed composition. This obviously would not work for rendering compositions, (so maybe a warning should be used when a user has mouse.xy input in such compositions). This feature would allow us to make useful UI elements for future plugins, (both for current hosts - and future hosts). This feature may need to be different depending on different hosts and plugin formats, (FX-Plug v's VDMX for example). 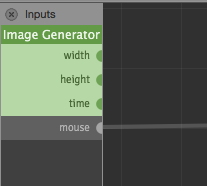 I know that even during Vuo development it would be useful to access mouse interaction with outputImage Image Generator windows simply to be able to move things, or interact, before rendering or exporting. The Image Generator and Image Filter protocols are specifically for noninteractive rendering, so I don't think it would make sense to add mouse interaction to those protocols. Instead, I'm thinking the solution is to add a new protocol called something like Pointer Interaction, that includes many of the ports from the Receive Mouse * nodes. And allow compositions to adhere to multiple protocols at once, so you could pick both the Image Generator and Pointer Interaction protocol at the same time. I updated the title and opened this feature request for community voting. Hey @steve, thanks for working out the finer points! I am really interested in this feature for use in fxplugins generated by Vuo. However this may be an fxplug only feature? Outside of Vuo Editor, the proposed Pointer Interaction protocol would work in any host app that has implemented support for it. The host app (I mean something like VDMX or CoGe that supports running Vuo compositions) would be responsible for sending mouse data into the published input ports. FxPlug has a different, more involved way of inputting mouse data and other "onscreen controls" (https://developer.apple.com/library/mac/documentation/AppleApplications/...). That's beyond the scope of the Deploy compositions as FxPlug plugins feature request, and orthogonal to this feature request, so feel free to create a separate feature request if that's what you're after.